What is the impact of transport emissions on air pollution and the natural environment? What can we do to reduce air pollution coming from transport? To what extent can emissions be reduced if solar powered cars instead of petrol-powered cars are used (e.g. in a neighbourhood, in a town, in a country, in EU, etc.)? 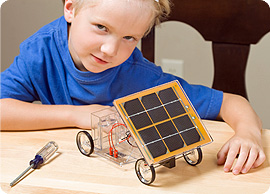 Why are solar cars of interest in the EU and throughout the world? In Cyprus, as in many other European countries, solar car races attract people’s interest. Groups of students and adults design and build their own cars to participate in these competitions. Furthermore, big car companies invest money and technology in future solar-powered cars. This task aims to provide students with opportunities to discover the significance of adapting and using solar energy in transportation whilst exploring relevant mathematical and scientific content. Students complete a number of activities in mathematics, science and technology, applying knowledge from all three disciplines. Building on existing understanding and working on interdisciplinary activities, students will design, build and operate a model solar car.